Bees are beneficial insects that pollinate flowering plants by transferring pollen from one flower to another. This is important for plant reproduction and food production. In fact, pollinators are responsible for 1 out of every 3 bites of food you take. While the honey bee gets most of the credit for providing pollination, there are actually about 500 bee species in Ohio. Approximate size. Your bee may vary slightly. Identifying behaviors to watch for. Additional ID features that may be seen with the aid of a hand lens. All bees have three body segments, a head, thorax and abdomen. The head is where large multi-faceted eyes, long slender antennae, and cutting mouthparts are found. The thorax is the middle segment where the wings and legs attach. Last is the abdomen, which for female bees ends in a sting. Special pollen-carrying hairs unique to female bees resemble dense broom bristles, and are commonly found on the rear legs or the underside of the abdomen. Some carry pollen in an almost hairless, flattened pollen basket on the rear legs. Light to dark brown body with pale and dark hairs in bands on abdomen. Pollen basket present. Abdomen barrel-shaped. Head heart-shaped. Common nesting locations Colonies nest in artificial hives, in the open and in cavities. Bees swarm to divide the colony. Honey bees have hairy eyes. Black body with light or dark hairs. Pollen-carrying hairs beneath abdomen. Some have rather pointy abdomens. Head is as broad as the thorax with large mouthparts used to cut leaves. Common nesting locations Solitary, but nest in aggregations in above-ground pre-existing holes, natural or artificial. Behaviors to watch for They cut circular pieces from leaves which are used to line their nests. Black body, extensively covered with black and yellow hairs on all body segments. Pollen basket present. Robust body. Long face. Common nesting locations Colonies nest underground, commonly in old rodent burrows. Behaviors to watch for Bumble bees pollinate in cool, cloudy weather when most bees are at home. Two forms: (1) bright metallic green or (2) black/brown with light bands of hair on the abdomen. Pollen-carrying hairs on rear legs. Slender body. Common nesting locations Nest in the soil, solitary to communal nesters. Behaviors to watch for Some are attracted to the salt in your sweat. Black body with light or dark hairs. Pollen-carrying hairs on rear legs. Similar body shape to bumble bee, but abdomen shiny and mostly lacking hair. Round face. Common nesting locations Nests are burrowed into wood, often in roof eaves. Behaviors to watch for Fly fast and erratically like a hummingbird. Two forms: (1) black body covered in pale hairs or (2) dull metallic green-blue and less hairy. 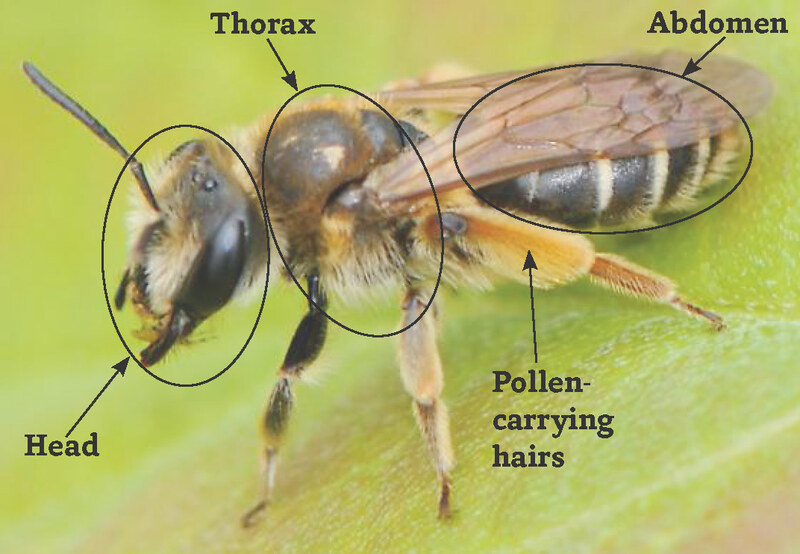 Pollen-carrying hairs beneath abdomen. Head as broad as thorax, robust body. Behaviors to watch for Collect mud to line their nests. Brown body covered in dense light hair on the thorax and in bands on abdomen. Pollen-carrying hairs on rear legs. Long antennae. Appear to have protruding "nose." Common nesting locations Ground nesting, mostly near squash and pumpkin fields. Behaviors to watch for Only collects pollen from squash/pumpkin plants. Dark blue-green and shiny, appearing hairless on all body segments. Pollen-carrying hairs on rear legs. Slender with shield-shaped abdomen. Common nesting locations Solitary, nest in twigs and stems. Additional ID features that may be seen with the aid of a hand lens Pale yellow marks on face. Females have vertical bar, while males have upside-down "T."
Black with light or dark hairs. Slender. Pollen-carrying hairs on rear legs and side of thorax, appearing to carry pollen in its "armpit." Dig solitary ground nests. Prefer sandy soils. Additional ID features that may be seen with the aid of a hand lens Shallow depressions between their eyes and antennae hold short velvety hairs. Black body covered in dense pale or dark hairs. Pollen-carrying hairs on rear legs may be very long. Stout-bodied. Males have extremely long antennae. Common nesting locations Solitary to communal ground nesters. Behaviors to watch for Some are especially attracted to asters, sunflowers and daisies. Some insects that you will see visiting flowers are bee mimics. While they are not bees, they may resemble them in appearance. But don't despair! Simple characteristics will allow you to decide if what you are looking at is indeed a bee. Common bee mimics are flies and wasps. A fly has only 2 wings, while a bee has 4. They have sucking mouth parts, without the jaw-like mouthparts of a bee, and their antennae are not long and slender like a bee, but short and stubby or feathery. Some, but not all flies are easy to spot because their eyes meet in the center at the top of their head. A wasp has 4 wings, chewing mouthparts, a sting, and long antennae like a bee. However, wasps are smooth and almost hairless, while bees are generally covered with hair on their bodies and legs. Wasps also tend to have slender waists and they will never have pollen-carrying hairs. Certain wasps make paper nests you will find hanging from a tree or building, while bees do not. A final clue: If your insect is eating another insect, it may be a fly or wasp. Bees are vegetarians and only eat pollen and nectar from flowers. 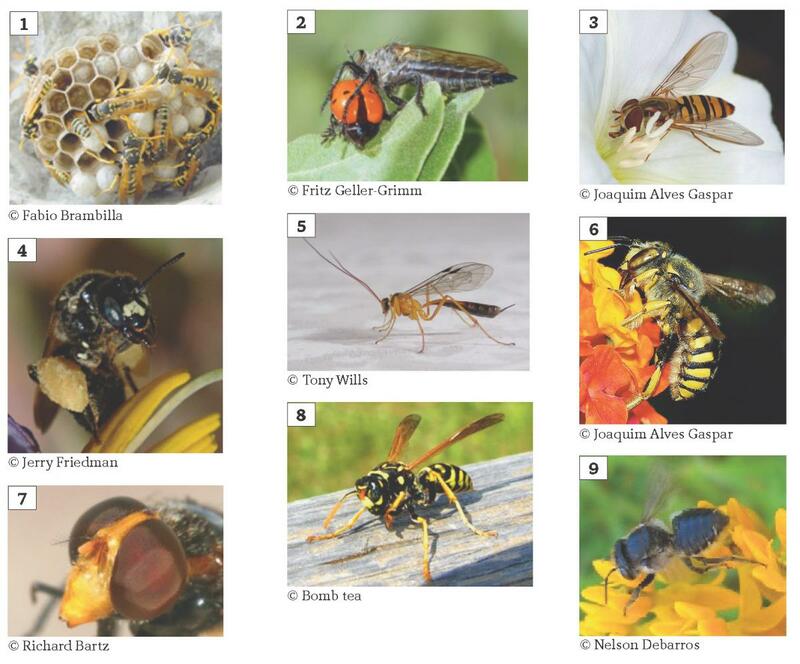 Now that you are a bee and bee mimic expert, try your hand at identifying these insects. Answers are at the bottom of the page.